While electrolyte enhanced beverages are certainly nothing new, their recent boost in popularity has stirred up curiosity over how they fit into a healthy lifestyle. These beverages are especially common among athletes and fitness enthusiasts. Are electrolyte-enhanced drinks a passing fad, or do these beverages deserve a permanent spot in every refrigerator? Keep reading to find out more about the science behind electrolytes, electrolyte-enhanced beverages, as well as how they can be incorporated into a healthy diet. What Does "Electrolyte Enhanced" Mean? Electrolyte enhanced beverages are those that have electrically charged minerals, such as sodium, chloride, and potassium. While drinking an ample amount of fluid is essential to staying properly hydrated, the body cannot absorb the fluid without the proper balance of electrolytes. An electrolyte-enhanced beverage promotes hydration by helping to replenish the electrolytes that are lost during heavy exertion, sickness, or extreme temperatures. Two things are required to ensure that the body stays properly hydrated: sufficient fluid and a proper balance of electrolytes. Electrolytes, which are salts, acids, and bases that contain ions, allow messages to be transmitted and received throughout the body. Electrolytes are essential for proper hydration because they are what allow the body to absorb the liquid it takes in. According to the National Institute of Health, maintaining a proper balance of electrolytes is essential for optimal health. This balance ensures that the muscles and nerves are able to function normally, and it encourages optimal health for the organs and cells. Electrolytes also help in regulating the proper fluid levels and the balance of acid and alkaline in the body, which are necessary for overall health and fitness. While the body absorbs many electrolytes naturally from food, such as sodium, calcium, magnesium, phosphate, and potassium, these can be lost during an extended period of strenuous exercise, exposure to extreme heat, or when the body is suffering fluid loss due to an illness. When the body's balance of electrolytes is thrown off, drinking water alone is often insufficient for returning to the proper level of hydration. Electrolyte enhanced beverages work with your body to restore the correct balance of electrolytes and absorb the water you drink. There are many different types of electrolyte enhanced beverages available today. These drinks are not only convenient and delicious, but they also offer significant benefits for drinkers. One of the most widely recognized benefits of drinking electrolyte enhanced beverages is that it can prevent dehydration. An electrolyte imbalance is recognizable by a wide range of symptoms, including fatigue or weakness, nausea, vomiting, sweating and problems with kidney function. By consuming a beverage that contains electrolytes before, during, and after exercise, or while your body is losing fluids due to a virus or extreme temperatures, you can avoid the dangers of dehydration. Research has shown that the body is able to function best when the blood has a pH level of 7.4. This level, which indicates the acidity or alkalinity of the blood, can be thrown off when the body is not properly hydrated. Electrolyte enhanced beverages contain sodium and chloride electrolytes, which prevent the blood from becoming too acidic. As a company dedicated to helping its people and community, Bernick's is proud to offer electrolyte-enhanced beverages. With a range of products that provide energy, ensure proper hydration and aid in recovery after strenuous activity, Gatorade in particular features electrolyte enhancement in a variety of forms. From low calorie powders to thirst quenching beverages that are ready to drink, electrolyte enhanced products will give the body what it needs to face any challenge. 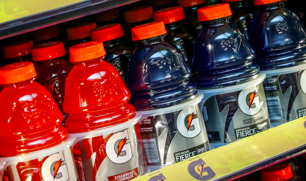 In addition to Gatorade sports drinks, Bernick’s also distributes a variety of electrolyte enhanced waters such as Essentia Water, Propel Electrolyte Water, and Klarbrunn übr Water which offer all of the benefits of sports drinks without the calories.